Hey, that tastes good! : Pupusas! sort of delicious to me. These look fairly labor intensive, but believe me they're fairly easy. *You can also put refried beans, meat, and other things inside. Mix the cheese and jalapeno. 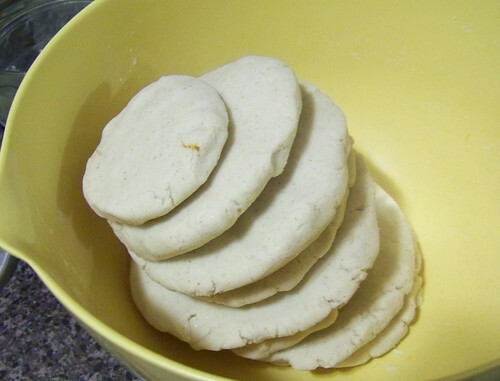 Put the masa harina flour in a bowl and make a well in the middle. Pour in 1/2 c of the water, mix in, and keep adding water and mixing (it's best to use your hands) until when you form a ball of dough and flatten it, it doesn't crack on the edges. Only add water a little at a time. Once the dough feels right, moisten a paper towel. 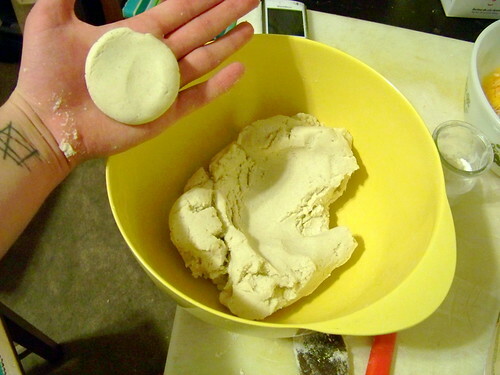 Take a ball of dough a little smaller than your palm, and flatten it out so its a little thinner than a half an inch thick. Put a big pinch of cheese mixture in the middle, and then start to work the sides up around it. Pinch them like you're making a little pot, then keep working the dough up and over into the middle until the cheese is covered. Form the dough back into a neat ball, and flatten until its about a half an inch thick, maybe a little thinner. You can make them smaller if you want. Keep the rest of the dough covered with a moist paper towel while you do this. Put the formed pupusas on a plate, and repeat with the rest of the dough. This should make about 8-10 pupusas. Heat a cast iron pan (I guess you can use a regular skillet, or a griddle if you have one!) and wipe the bottom with an oiled paper towel so there is a light, light coating of oil on the pan. Heat over medium low. Once the pan is hot, put in 3 or 4 pupusas, and let cook about 5 minutes per side, taking care not to burn them. They should have a few brown spots when they're flipped. Repeat with the rest of the pupusas, and eat while hot. You can also wrap them up in plastic and keep in the fridge, reheat in the toaster. Or freeze them. Delicious! WOw, thank you for the great step by step recipe! These look fantastic and tasty. Can you tell me, how are these different from arepas, which I am also seeing all over the blogs. 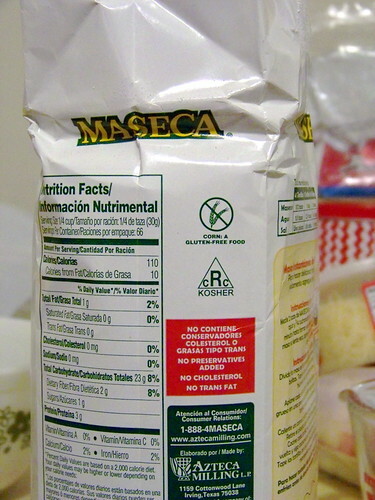 Also, does it require instant masa, as your bag says, or is any masa acceptable? Thanks for sharing!! I don't know if you could use another masa, I've only ever used this kind for anything! I'd google it. 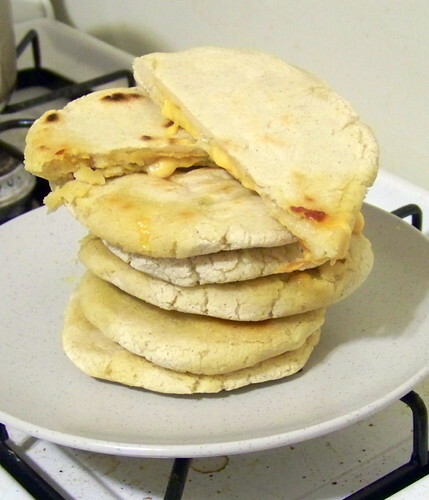 Arepas are made with a different corn meal, although they an be made from this masa, and arepas are baked after they're grilled, and then split open and filled like an english muffin, while pupusas are filled before theyre cooked! Thanks for the info! I'll see what I can find out. I'm excited to try making them both! Those pupusas at the top of the post look a lot better than the pupusas from Veracruzana in Northampton. Theirs were greasy/soggy (as they often are in my experience), but yours look delish. ak- Oh, good, that makes me feel better about missing out on them. I was pretty bummed. So I went to a Salvadorian place and got pupusas, just out of curiosity. They came with curdito. I understand pupusas are eaten by hand, but how does the curdito fit in? Do you fold the cabbage inside the pupusa, or just eat it alone, or what? I just decided to put the cabbage on top and eat with a fork. honestly I don't know about the curdito, I would guess eating it on top sounds right! Your supposed to pile the curdito on top... and yes you can eat them with a fork. 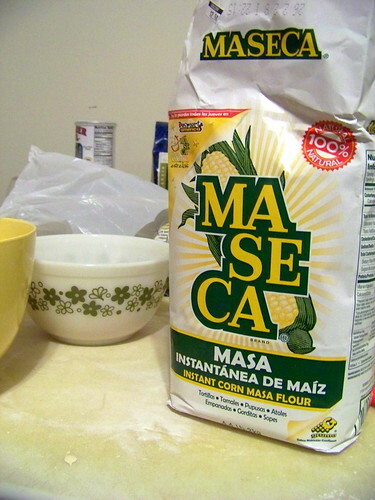 Any masa as long as its corn will work... but maseca is the preferd brand of most latin cooks... hope that helps!